Julia Amanda Perry was a prolific composer of neoclassical music during her relatively brief life. Born on March 25, 1924 in Lexington Kentucky, she spent most of her early years in Akron, Ohio. Her father, Dr. Abe Perry, was a doctor and amateur pianist, who once accompanied the tenor Roland Hayes on tour. Her mother, America Perry, encouraged her children’s musical endeavors; both Julia and her sisters studied violin from a young age, Julia switched to the piano after two years of violin. 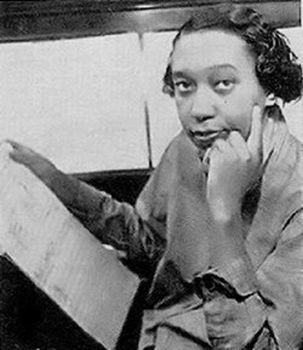 Upon graduating from Akron High School, Perry attended Westminster Choir College in Princeton, New Jersey from 1943 to 1948, where she graduated with a bachelors and masters in music. Her master’s thesis, Chicago, inspired by the poetry of Carl Sandberg, was a secular cantata for baritone, narrator, mixed voices, and orchestra. She continued her musical training at the Julliard School of Music and she also spent summers at the Berkshire Music Center in Tanglewood, Massachusetts. Her first major composition, the Stabat Mater, appeared in 1951. Three years later in 1954 her opera, The Cask of Amontillado, was first staged at Columbia University. She also wrote Homage to Vivaldi for performance by symphony orchestras. In 1971, however, Perry suffered the first of two strokes which left her hospitalized for several years. She taught herself to write with her left hand so she could continue to compose. During her life, Perry completed 12 symphonies, two concertos, and three operas, in addition to numerous smaller pieces. Julia Amanda Perry died on April 29, 1979 in Akron, Ohio. She was 55.